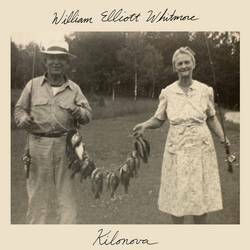 William Elliott Whitmore’s raspy folk pulls from diverse influences that are on full display over the span of 10 covers on Kilonova that don’t really sound like covers, putting his timeless and heartfelt stamp on songs originally recorded by Bad Religion, Magnetic Fields, Johnny Cash, and more. It’s an impressive feat, considering the nature of the cover song combined with that wide breadth of styles. This record remains both true to Whitmore’s established catalog of love-the-land folk, but it shows more range as well, delving subtly into bluegrass, country, and gospel at different times – often in line with the original songwriters’ style (though not exclusively so). At times it’s a jarring changeup from the original, like with “Don’t Pray on Me,” which proves that Bad Religion can write a masterful folk song, and at other times, as in “Five Feet High and Rising,” where it clearly pays homage to the songwriter (here, Johnny Cash, where Cash’s unmistakable lyricism is on full display and Whitmore even enunciates in tribute). “Fear of Trains” (Magnetic Fields) and “Don’t Pray on Me” are my personal favorites among the 10 tracks here, with each of those putting Whitmore’s distinct touch to well-written songs originally performed in vastly different styles. I have yet to hear Whitmore swing and miss on a release, though the Captain Beefheart cover “Bat Chain Puller” doesn’t do much for me here. I prefer his stripped down-to-the-essence songs where his weathered voice and his acoustic guitar are dominant, with occasional variation via banjo or acapella “Country Blues” (Dock Boggs). Any fan of Whitmore’s back catalog will enjoy this record and it manages to feel authentic instead of like a novelty, which isn’t something I can say for many covers albums over the years, especially in the post-ironic era where covers are often just a tongue-in-cheek genre change. Kilonova is a worthy addition to Whitmore’s collection, though in a big picture sense I prefer his originals. Posted Sept. 3, 2018, 10:34 p.m.
Posted April 30, 2018, 5:53 p.m.
Posted Nov. 17, 2016, 8:26 a.m.
Posted Dec. 30, 2014, 10:40 a.m.